Today we will be making simple subtractive synth patch in Absynth to show you the basic principles behind synth programming in Absynth. We will limit ourself to more standard features of Absynth for this tutorial. We will also look into controlling the synth with Macro Controls, envelope scaling and few other very useful basic tricks. This is the sound we will be creating along with some other variations. First let’s set the global number of voices to 2. Lower number of voices works better for this type of sounds. Go to the Perform window of Absynth and set the poly number to 2. This means two notes can sound at the same time. This is the midi sequence we will be using in this tutorial. First we need solid saw wave. Absynth offers a wide range of saw waves in it’s wave library and they are all worth experimenting with. I will use Saw_real in this tutorial. But you could try and change it to some other saw wave types. Now let’s add filter. 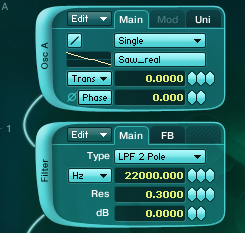 First three filter types LPF 2 Pole, LPF 4 Pole, LPF 6 Pole have much softer and rounder sound than other three LP filters available in Absynth. We will use LPF 2 Pole filter which is analog design lowpass filter with signal attenuation of -12dB per octave. Set filter frequency to 22000 Hz and resonance to 0.300. Set Osc A to Double mode to fatten up the sound. Osc A will now have two oscillators mixed together. The Main and the Mod one. Click on the Mod oscillator tab. Now for the waveform of Mod Osc I have chosen the Fifth waveform because of harmonic quality it adds to our basic tone. Also detune Main and Mod oscillators relative to each other. So we sholud set Osc A Main to 0.0500 and Osc A Mod to -0.0500 and then drop them for an octave to get a bit more solid and heavier basis for our sound. So set Osc A Main to -11.9500 and Osc A Mod to -12.0500. To give the sound some wideness we could raise the voices of oscillator A to something higher than one but let’s rather add another two oscillators B and C and keep this oscillator as it is. 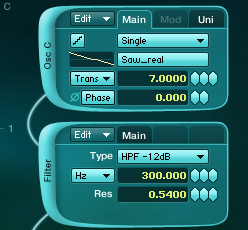 Enable Osc B and Osc C.
Set them both also to saw_real waveform but set the transpose control of Osc B to 3 and Osc C to 7. This means Osc B will play 3 semitones and Osc C 7 semitones higher than Osc A. First we should work on amplitude envelopes of each oscillator. One great thing in Absynth is also you can easily turn off whole channel in a patch and monitor only certain parts in your patch. Monitor each oscillator separately and then together to work out the amplitude envelopes for each oscillator. I’ve set the envelope of Osc A with a little bit of attack so the lowest part of our sound has a bit of a softer attack. Osc B has shortest envelope and zero sustain so we get almost plucked like sound. I have set Osc C envelope to something similar to envelope A. Try and turn off Osc A and B for a moment. To my ears Osc C sounds a bit too dominating in our sound. We should use high pass filter to lower it’s low and low mid frequencies. 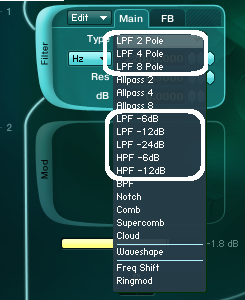 Enable Filter C and set it to HPF -12dB. Set the cutoff of the filter to 300 Hz and resonance to a bit over 0.500. Here is how Osc C sounds before and after the filter. Osc A and Osc B are muted in this sound example. We should use some waveshaping to give our sound some edge. But let’s first work on the volume balance of our three oscillators. Osc A will be as a basis of our synth sound so it has to be the loudest. Set mixer sliders of Osc A to -1.5 dB, Osc B to -6dB and Osc C to -4.5dB. Also we could pan our secondary oscillators B and C and to do that we have to enable the button in the lower left corner. Now pan Osc A and Osc B like in the picture below. Now we can add waveshaping to our sound. This will produce additional harmonics in our sound. Also Waveshaping reacts to the amplitude of the input signal: the sound changes depending on the volume envelope of the oscillator or any other form of oscillator volume control. Enable master waveshape module and set input level of the to -1dB and output to 3dB. 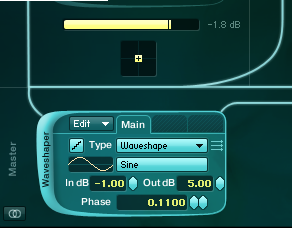 Also adjusting the phase of the waveshaping module can have a great impact on the sound and some cool effects can be achieved with carefully adjusting this parameter. Set phase to 0.1100 for now. We should also assign envelope to modulate filter cutoff frequency of our main part of the sound, oscillator A. Right click on the filter frequency control of filter A and choose Create a new envelope from the drop down menu. This will automatically take you to the envelope edit window. Set the filter envelope to something like this. As you can see I have raised the release part of the envelope so the filter doesn’t shut off completely on each end of the note but instead it raises again. You can hear the major impact this has on sound. Here is before and after sample. Also we would like to control the envelope with velocity value of the note played. Absynth has a bit unusual way of assigning velocity modulation to envelopes. Nonetheless it is very powerful way since you can control any breakpoint(s) in your envelope you choose with velocity values or with one of the macro sliders. 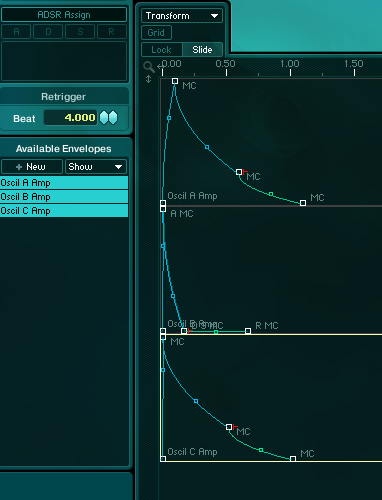 You can control each breakpoint amplitude and also breakpoint time so you can stretch and expand whole envelope just by varying velocity values of your notes. Click on the A breakpoint. Click on the Control tab to enable the Time and Amp Macro of the breakpoint. As a modulation source for modulation of envelope’s amplitude and time choose velocity. Seth both modulation amounts to 100 like in the picture below. Now velocity controls the amplitude and time of the breakpoint A. If you vary the velocity values of your notes you should see the envelope changing it’s shape. Note that you can create additional breakpoints and each can have it’s own Time and Amplitude settings. This is a very unique and powerful feature of the Absynth since you can morph envelopes in real time in a very complex manner creating all kinds of variations and dynamics in the sound. We should also use master LP filter to filter the highest frequency content of all our three oscillators together. I have used LPF -24dB. Enable master filter and set it’s cutoff to fully open. Here is before and after sound example. Now we can also clearly hear velocity affecting the filter A envelope. To add even more movement to our sound let’s add some filtered delay. I’ve used Ableton ping pong delay with these settings. Right click on the resonance control of the master filter and choose macro control 1 from the drop down menu. Now resonance control is assigned to Macro Control 1 and ready to be automated. As one final thing we could also assign Balance level in the Mod oscillator A to Macro Control 2 so we can change the mix between Osc A’s Main and Mod oscillators. First set Balance level of the Mod Osc A to 0.9000. Now we can automate the mix amount of Mod and Main oscillators in Osc A. This can produce some nice effects. Also experiment with different waveforms for Mod oscillator A. Here is one variation with StairStep waveform. Here is another very cool feature of Absynth. Click on the little arrow of the Macro Control 1. This will open a drop down menu and choose Make into the XY entry. This will create XY controller for Macro Control sliders 1 and 2. This is a very powerful way of controlling various parameters in Absynth. Here we go, this is an example of simple subtractive synth in Absynth. Hope you have enjoyed this tutorial and learned something new.